If you’ve followed my blog for any length of time, you know that I’m a HUGE pasta lover. Pasta dinners are pretty much my #1 go-to food, especially if I’m feeding a bunch of people (or want some awesome leftovers for the week). This particular pasta dish – Risotto-Style Pasta With Carrots — is one that I’ve made many times, but never photographed/blogged about until now, because it gets gobbled up so quickly! So, the last time I made it, I made sure to set aside a few minutes to take a couple quick pictures, so I could share it with y’all. 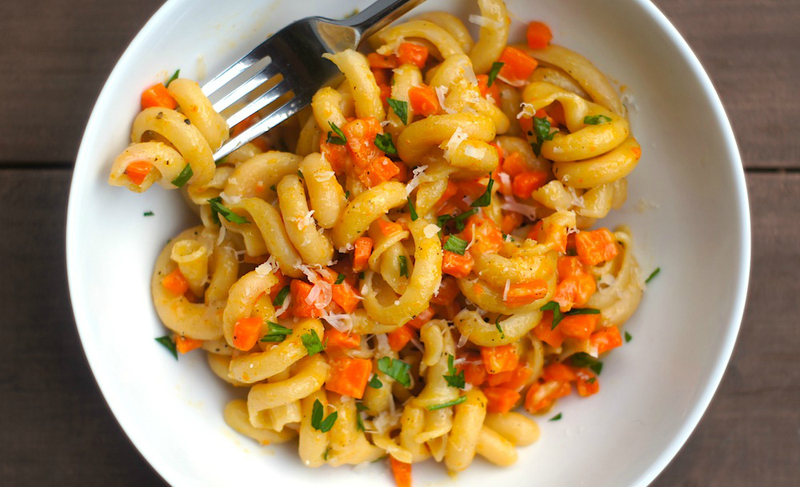 First, onions, pasta, + carrots are toasted in butter, bringing out complex, sweet, nutty flavors. Then, hot broth is added gradually to cook the pasta risotto-style, which results in a creamy, lush pasta. Finally, more butter + parmesan are added, adding even more richness and creaminess to the dish. The original recipe calls for carrots, which I did use here, but my husband (wisely!) pointed out that this would be great with lots of different types of root vegetables. Parsnips, butternut squash, and sweet potatoes would all be a fabulous substitute for the carrots, especially in the fall, when they’re in season. I can’t wait for y’all to try this dish – I promise that you are going to love it! 1. Bring chicken stock to a boil in a medium saucepan over high heat. Reduce heat to low to keep stock hot. 2. Melt 4 Tbsp. of the butter in a medium heavy-bottomed pot over medium-high heat. Add onions, a good pinch of salt + pepper, and cook, stirring with a wooden spoon, until they begin to brown, about 5 minutes. 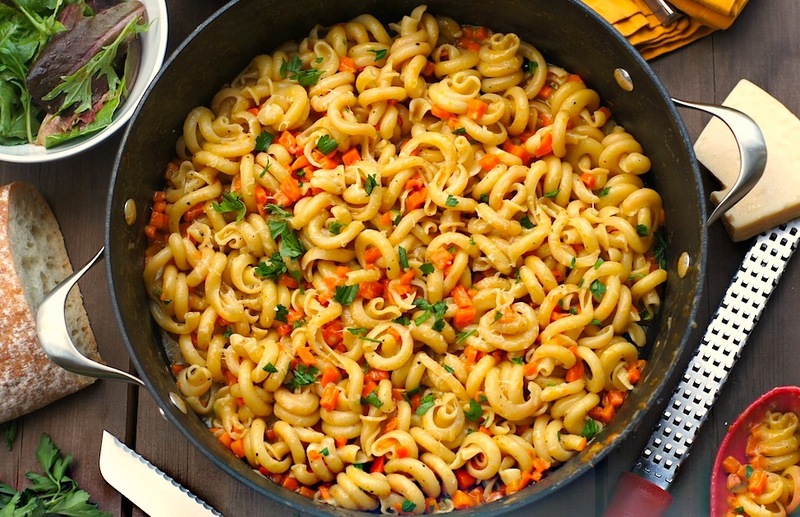 Add uncooked pasta and carrots and cook, stirring often, until pasta is lightly toasted, about 5 minutes. 3. Add 1 cup of the hot stock at a time to the pasta, stirring constantly; wait until almost all the stock has been absorbed before adding more. Continue cooking and adding stock (you may have some stock left over) until pasta is tender but firm to the bite, 10–15 minutes. 4. Remove pot from heat and stir in the remaining 1 tbsp. butter and the parmigiano. Season to taste with salt and pepper. Transfer to a warm serving dish and garnish with parsley. Serve with more freshly grated parmigiano, if you like. I love the sound of this pasta – and I’d happily make it with any root vegetable! This sounds like such comfort food! I’m a big fan of pasta too, but never cooked with that gorgeous twisty stuff. Must try it! I’ve never thought about cooking pasta this way; what a great way to change it up. This sounds really tasty. Can’t wait to make this for dinner soon! This looks great! I enjoy making pasta this way . In fact, my favoraite type of pasta to cook in this style is orzo, to make what is known as “orzotto” – a sort of take on risotto. Give it a try next time you are in the mood. I will have to try this recipe. I bet it is stellar. I’ve had orzotto at restaurants, but never tried making it myself. Orzo is one of my favorite pastas, though – I love it in soups and cold pasta salads. I will have to give orzotto a try at home! I’m a HUGE pasta lover too. I could eat it every day. This dish looks amazing AND kid friendly! 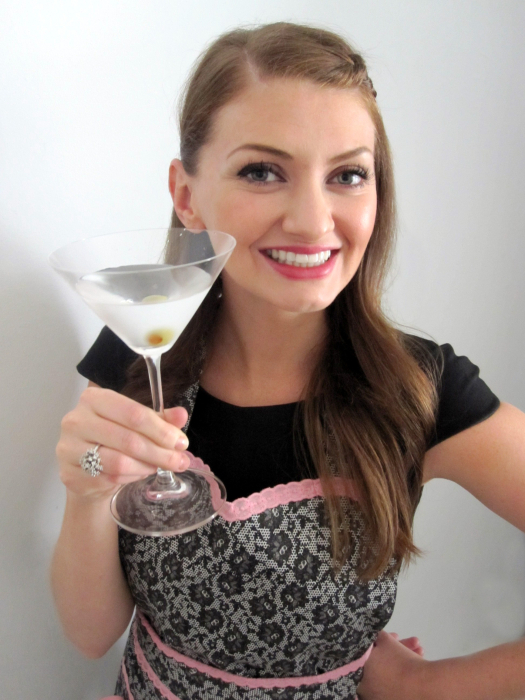 I could totally see my two girls downing this. Pinning! Risotto style pasta sounds amazing! I love the creaminess that happens when making risotto, so I’m sure this is similarly delicious. We have a ton of carrots in the garden – seriously, a ton! (Ok not a ton but you get the point). I love the idea of using them in this yummy pasta – totally going on our dinner menu! I love pasta and have never heard of cooking it risotto style – pinned, I can’t wait to try this! I’ve never cooked pasta risotto-style before, but it sounds like a really great technique to try! This looks delicious. I love visiting your blog for all these brillian pasta ideas! Your pastas are simply amazing! I have been craving carrots as of late. I’ve never thought to put them in pasta like this before! What a creative and delicious dish! Looks like such a fresh lite dish, yummm!